Author: Topol, Jachym Set In . . . Description: Winner of the Egon Hostovský Prize as the best Czech book of the year, this epic novel powerfully captures the sense of dislocation that followed the Czechs’ newfound freedom in 1989. More than just the story of its young protagonist—who is part businessman, part gang member, part drifter—it is a novel that includes terrifying dream scenes, Czech and American Indian legends, a nightmarish Eastern European flea market, comic scenes about the literary world, and an oddly tender story of the love between the protagonist and his spiritual sister. This is a novel for readers who want an unforgettable reading experience. "City Sister Silver" is the only novel of the 1990s included on a list of the hundred greatest Czech prose works of the 20th century (from a survey of Czech writers and critics done by the newspaper Týden ("Week"); it came in #26). Always surprising and fast-paced, "City, Sister, Silver" is at once satirical and romantic, wild and controlled. The novel is full of storytelling, myths, dreams and nightmares, shifting through a variety of genres. What makes it so special is its language, its energy, and its ability to creatively capture the feelings that accompanied the opening up of Central and Eastern Europe in the 90s. As one Czech critic wrote, "City Sister Silver tells me more about the epoch than many of the books that try so hard to articulate and explain the burning ideas of the day." a prodigal astonishment; an emancipation proclamation. Topol's book is a fervent effort by a post-Cold War writer to break away from the familiar dissident mode of his seniors and to stake out the fresh troubles that freedom —and, more to the point, a raw market economy have spawned since the Velvet Revolution. 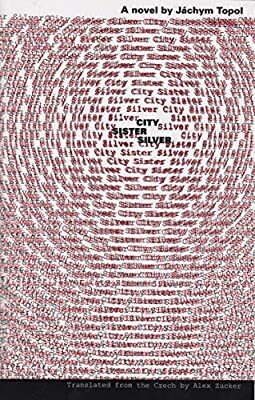 Readers embarking on "City Sister Silver" are in for an exhilarating, exasperating journey ... kaleidoscopic and ethereal, full of motion for its own sake, with many memorable stops along the route.